“Constantin Brancusi Sculpture” at the Museum of Modern Art presents 11 of the influential artist's sculptures along with photographs, drawings and films. Brancusi was born on a farm in rural Romania in 1876. As a boy, Brancusi was a Shepard but he displayed a talent for carving things out of wood. Leaving home at the age of nine, he traveled to the nearest large town and earned a living through a succession of menial jobs. However, his interest in carving continued and he caved various items including a violin. His carving talent so impressed a local industrialist that he arranged for Brancusi to attend the Craiova School of Arts and Crafts. After graduating, he continued his academic training at the Bucharest School of Fine Arts. In 1903, Brancusi decided to leave Romania and traveled first to Munich and then to Paris in 1904. To continue his artistic training, Brancusi enrolled in the Ecole des Beaux-Arts. He also briefly worked in the studio of Auguste Rodin, the leading sculptor in Paris. Although Rodin had been a revolutionary when he came upon the art scene a generation earlier, Brancusi considered the work being done in Rodin's studio too conventional. By 1907, Brancusi was a mature artist. Abandoning the way most of the artists around him created sculpture - - molding the sculpture out of clay or plaster and then casting it in metal - - Brancusi returned to his roots, carving his sculptures out of wood or stone. In addition, a member of the avant garde circle of artists working in Paris at that time, Brancusi's sculptures became lesss and less realistic. While he still created portraits of people and animals, they verged on abstraction. Brancusi strove to reduce the forms to their essence. His works evoke, rather than replicate, the subject. Five of Brancusi's sculptures were included in the landmark 1913 Armory Show in N ew York City, which introduced modern art in New York. From that point, Brancusi was a successful artist with an international reputation. He continued to work in France, returning occasionally to Romania, until his death in 1957. The exhibition surveys Brancusi's sculptural work. (Like his friend Man Ray, he was also interested in photography and film). Brancusi would often return to subjects from time to time and rework the idea and so there are series of works built around certain concepts. One example is “Bird in Space” series. In these works, the figure of the bird has been distilled down to a smooth curving form depicting the motion of a bird in flight. When customs officials encountered one of the "Bird in Space" sculptures that was being imported into the United States, they refused to allow it the exemption from customs duty that is normally accorded works of art. The sculpture did not look like a bird. Rather, it looked like an industrial object. This led to a landmark court decision in Brancusi's favor. The court held that a work did not have to look like nature in order to be art. Rather, what was important was the artist's concept. 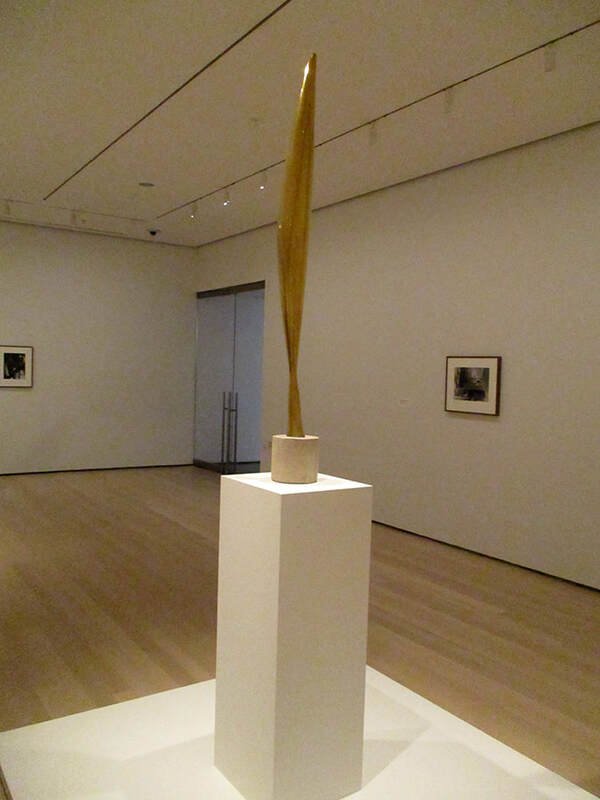 Also included in the exhibition is a work from Brancusi's “Fish” series. This is a large slab of polished marble. Once again, it does not like an animal. However, it does recall the movement of a fish as it swims in the sea. 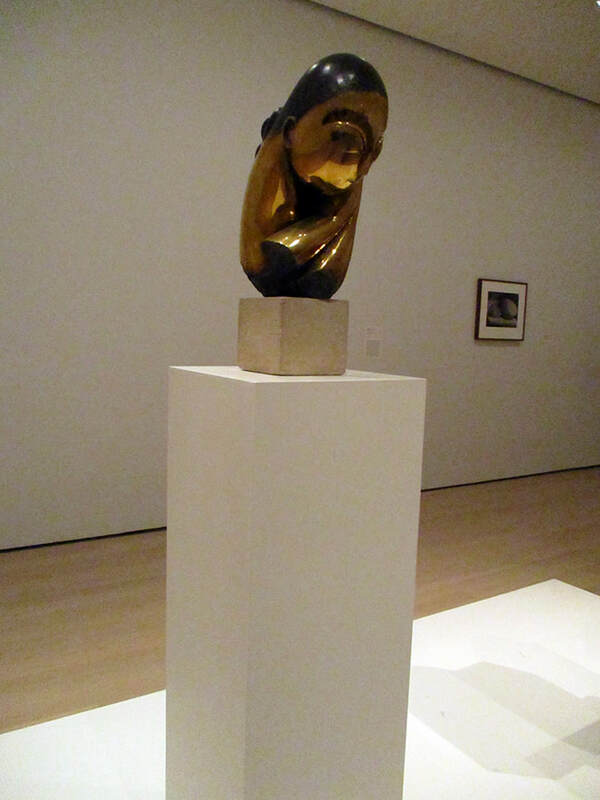 Brancusi also created the pedestal on which the sculpture stands. He felt that the pedestal was part of the visual experience and so he often carved the pedestals for his sculptures. Brancusi was not just inspired by animals. The exhibition includes his portrait of Hungarian artist Margit Pogany. It is an oval-shaped bronze with large almond eyes, an angled nose and curving hair. The influence of African tribal masks is readily apparent. However, the polished bronze merges this influence with industrial society. 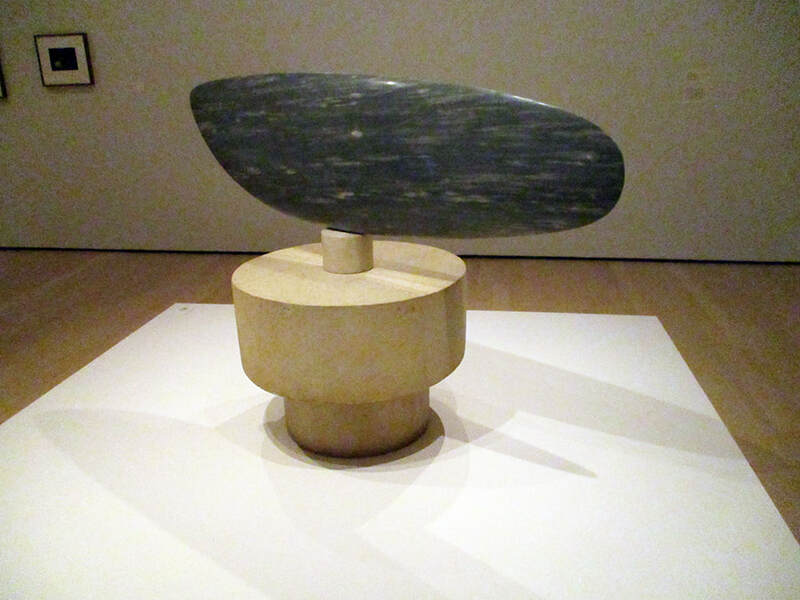 Radical in their day, Brancusi's style now seems familiar. This underscores the extent of his influence. "Portrait of Mlle. Pogany" by Brancusi.